There are 23 articles in this month. Bill Starr goes over the finer points of training to lift big loads in strongman competitions. In Building Behemoths: Part 1, I outlined a number of exercises useful to any athlete training for any type of strongman competition, including those planning on entering any level of Highland games. Harvard University Crew members and coaches advise CrossFit athletes to use pacing to become more efficient on the rowing machine. For many CrossFit athletes, the rowing machine is like a first date: a blend of dread and discomfort. The problem often isn’t a lack of fitness but a lack of understanding of pace. 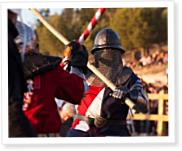 Medieval combat fighters from the U.S. take seven of nine gold medals at world championships held May 1-4 in Spain. In a sport based upon the unforgiving, brutal armored battles of medieval Europe, it was Team USA who proved winningest at the International Medieval Combat Federation world championship. But what some call irony, team members quickly dismiss. On Episode 330 of CrossFit Radio, host Justin Judkins interviewed multi-year CrossFit Games competitor Ashleigh Moe and North Central Regional winner Alexandra LaChance. This episode was webcast on May 14, 2014. It’s three weeks before the 2014 Reebok CrossFit Games Regionals begin, and Julie Foucher is dividing her time between medical school and the gym. She trains in the morning, focuses on school during the day and then trains again in the evening. It’s 5:45 a.m. in Sydney, Australia. Three-time CrossFit Games competitor Chad Mackay is finishing his breakfast. By 6:15, he’s got his first cup of coffee in hand and is off to coach the 6:45 class at CrossFit Active Waverton. “Pretty much a standard day,” Mackay explains while he drives. He’s at the chiropractor at 9 and at the exercise physiologist at 9:45. Just after 10:15, he’s stretching while he eats—with the clock running. “I didn’t realize at the time how dangerous that particular thing was,” Gill says.